That PVP community is the biggest problem there is in this game and its mainly due to the fact that its so small. There is maybe 30-50 players and the rest is just cannon fodder for them. They sync que, que dodge, throw and much more. That is this wonderful community, you can stream what ever you want, but thats how it really is. They share all info via Discord channels. With this they can manage ratings on all their toons with what ever means necessary. Apart from this we have individual cheaters who mostly work by themselves, but those face the difficulty of going agains the Devs and this community so they have no chance. I say these are groups of like 2-4 individuals, let's say members of the same guild or just people that have been playing together for some time. And yes there are probably a bunch of these groups, to go with your example let's say 30 people in total (wintraders and their partners in crime). You say these 30 people would organize on a global scale to have like a schedule or a plan of who gets which title from the very beginning. Now.. you know people. People are human. Humans are full of envy and rivalry. How do you think 30 people can possibly work together, I'll say it again, TOGETHER, on this? Don't you think person 16 doesn't want person 4 to get title X and rather have person 18 there? But then you have person 8 who wants 4 titles for himself, so person 5 would get none, also person 6 hates person 22 so much that they would never talk to each other. And so on... And if I understand your post correctly, you are implying that all 4 individuals of the podcast are part of that? That's a bold call.. There are certainly small groups of people that throw games for each other, and yes they are a problem, yes they should be punished. But they are also hard to detect. There are also people with rivalry that goes so far, that if on the same team, one would leave the game so the other person loses too. And yes they are also a problem, yes they should also be punished, and they are actually easier to detect. These people are ruining ranked for everyone, for people that never wanted to take part in this show because all they did was queueing for Solo Ranked. But instead of trying to convince the naive forum reader that there is a conspiracy going on that's just playing it's dirty game with you 24/7, you might rather give advice for how to react and report when witnessing obvious wintrading. If they don’t pvp already, how are they going to add value to a discussion about pvp? I'm actually impressed at how well you were able to not only blatantly lie about certain topics in the video, but that you were also able to construct a fully erect strawman and then knock it down in one swoop. Well done. Thanks for this, I am a sucker for constructive feedback. I should have time this weekend to get through all of it, I'll chime back in next week to prove it. Thanks again Snave for getting community together to do something to help with current state. Also seems we got a response maybe something constructive can come out of it. Any plans acting on some of the ideas discussed, like pvp guilds, help others , challenges even if just for training ? There was a lot of ppl watching so hopefully it will have a positive impact overall. They can talk about why they don't pvp. Did they try it and give it up? Has the rep of the community put them off from even trying? Would a "story mode" pvp where they can learn the basics help? Would larger group pvp create a safer space for them to learn the ropes? Your idea here. The podcast was well intentioned, well made and the people on it all made good points (excl Shek obviously). However everyone was talking from a very similar place; highly invested "top 10%*" pvpers. If you want to grow the PVP community then you have to hunt down the 90%* who PVP sporadically and those who don't PVP at all and find out what would make them participate more bigly. If you don't want to grow the community, all good, I hope you enjoy your first class seat by the pool of the Titanic with it's intimate view of nature's greatest wonders. Expertise is a nice example. All the participants pretty much took it as read that bringing expertise back would be A GREAT THING(tm). They openly scoffed at the idea that it might not bring joy to the hearts of all who witnessed its advent. Scoffed. Live on stream. Live stream scoffing. Which sounds like a Britishified version of ASMR. Breathily snorting disdainful mockery of your "soft'n'smooth" Spotify playlist into an elaborately sized microphone. And expertise is a great idea; if you only pvp and mostly on just one class. Your grind has turned to blown dust as Spiderman in Tony Stark's arms. But I am a proud, cross-classing, non-binary PVX player so, for me, expertise simply means more grind. A lot more grind. It also means PVP tanks in flashpoints and PVE node guards in warzones. And carrying two sets of gear. Four if I like to dibble in swapping from heals to dps. And I do like to dibble. And for the beginner who skips wide eyed and shiny faced into a warzone in their spinky new PVE gear? Three (four? five?) weeks of being crushed, roasted and humiliated before they can even START to be competitive. Jack, what is that ominous shape looming out of the inky Atlantic night? Jack? Where are you going with that door? JACK!!!!! 1) Easy accessible PvP gear through legacy comms that is granted at all levels of PvP, including low -/midbies. Would work flawlessly for for anyone doing PvP with any regularity. 2) Bolster that WORKS. Unless some have 14 pieces of PvP gear they are auto-bolstered based on class to default PvP set 1 (e.g. default bolster to 204 back in the day). Casual PvP-players don't have to bother with PvP gear at all. If they did it like that and they got it right e.g. no accuracy on sorc etc., then everything would be glorious. I can try to tackle the point of expertise from multiple different view points. First off, let's address gearing as a whole. When expertise was a thing, the gearing system had been revamped so that a full set of optimized PvP gear could be acquired for roughly 4k~ comms and you could get unoptimized base gear just for the set bonus for cheaper. This translated to about 2-3 days of grinding out warzones considering you won 100-200 wz coms per game, depending on medals and if you won. The difference between ranked gear and regular gear was only about 5-7% DPS, so all you really needed to be competitive was an optimized set of basic gear. Comparing this to PvE at the time, you had to use green gear from grinding your story, move to regular FPS> Hardmode FPS > Story Mode Operations > HM Operations > NiM Operations. This took multiple weeks due to the way the lockout system works for PvE to get a full set of gear. So naturally, gearing for PvP was much faster than it was for PvE. So to hear you state that PvE players had to spend a long time in the queue's getting slaughtered is disingenuous when you take your exact same argument and compare it to what it takes a PvP player to get up to par in PvE. It's not a fair comparison. Now the reason that expertise was suggested is because it's the easiest way to separate PvE gear from PvP gear in such a way that allows for PvP gear to be obtained quickly so that players aren't getting "slaughtered in the queue's" for weeks, while also allowing PvE to remain the gear treadmill that it was designed to be. Now, the current gearing system is definitely a positive for hybrid players who wish to participate in PvE and PvP, since they can essentially do any activity and get the gear they need for all activities they participate in. It's also a positive system for purely PvE players, because they can queue ranked and just /stuck it and get the materials they need to craft better gear at no real consequence, because they don't actually care about their rank anyway. This leaves pure PvP players left in the dust, which seems ironic to me, because it creates a situation where pure PvP players are shafted when trying to gear through their primary means of gameplay. So to better clarify my personal statements on stream, I would like a better gearing system, *regardless of whether it is with expertise or not*, however, expertise was a proven system that worked to separate PvP and PvE gear enough that it allowed each respective game mode to have a gear grind that matches the requirements of the aforementioned content. To clarify, if the devs are able to recreate the cheap/efficient gearing system for PvP while also not effecting PvE progression and without expertise as a stat, I will fully support that. I don't know where you got the idea that I was scoffing at the advent that some players don't like expertise, I personally rewatched the VOD to see where I did such a thing as that would be considered questionable behaviour because I recognize that my views do not fully reflect the views of the masses. I also state multiple times throughout the podcast that *my views are my personal views only and not representative of the majority of the playerbase*. I emphasized that point whenever I brought up a controversial topic for the very reason that some players might try to claim that I was projecting my thoughts onto their own, which I would never do. Sorry if it came off that way, and hopefully I cleared up any misconceptions about my thoughts on expertise. TLDR - I fully support a gearing system without expertise that is able to recapture the gearing system for PvP/PvE back in 4.0. However, I promoted expertise because it was a system that worked well enough for ALL players involved, without fully shafting the primary participants of PvP when they attempted to gear for PvP. Edit - Also, if you watched the entire podcast, I actually promote the idea of having *no gear* in PvP and equalizing all stats via bolster. This eliminates the gear grind completely and allows PvP as a game mode to focus *solely* on the important aspects of excelling at PvP, which is mechanics, techinical skills and execution. Unlike PvE, PvP does not have hard coded DPS checks, so the gear treadmill system is not as enticing as it is in PvE. Also, how is it *less grind* now if you play multiple classes? Are you not getting the 248/258 set bonuses for each class you play and instead playing with like, a sniper set bonus on a jugg? Because if you play multiple classes, that means you need multiple set bonuses. PvP gear took 2~ days to get a full set optimized, including the set bonus, doing that for all 8 classes would take roughly 2 weeks. There's 0% chance you have fully optimized set bonus gear for 8 toons with the current gearing system in 2 weeks. Thanks for taking the time to review our thoughts Mr. ️. I will reiterate that while we clearly don't speak for the entire community, the main objective was to open a productive dialogue between the developers and players so that all players, regardless of their personal opinions on what the correct way forward for PvP might be, can express their thoughts and feel like their opinions and ideas are at least being heard. 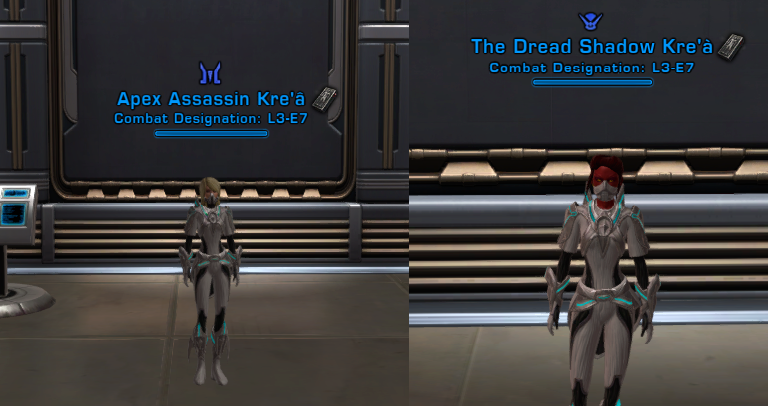 Adding on to what Krea said about expertise / gearing. If you want to pvp and pve (somewhat dependant on class) you'll need over 1 set of gear anyway. I main operative which needs 10% accuracy for pve, 0% for pvp. This means I still need to grind multiple same slot drops but now it takes me weeks. Expertise allows for mass, quick gearing. That's the point. No one is ever, or has ever, suggested you use this current gearing system but also add in ANOTHER set of gear.